I'm considering purchasing the matterport camera but I'm worried about a few things. I'm more interested in the 3D aspect of the camera, but I noticed when I download the obj files online, it's far from perfect. So I'm not sure if there are those of you who have succeeded in scanning a space with minimum distortion? - a lack of resolution (number of points), but a workaround for this is to increase the number of sweeps to get closer to objects. Accuracy in obj files seems to be correct however, this can be verified by measuring distances inWorkshop and comparing with the same taken in real life or, more technically, by comparing the obj files of the same room scanned twice. In another thread here, there was discussion about whether or not 200 scans was enough to cover a 9000 sq foot property. The consensus was that it was possible, but I'm sure that the resultant model would have a lot of holes, because you couldn't do very many scans per room. I recently scanned a 3500 sq foot property in 128 scans, which was a lot more than the minimum I needed to cover the space, but I wanted the resultant model to be mostly free of holes in the Dollhouse and Floorplan views. I am very happy with how it turned out. But even just scanning a property densely isn't enough. In a furnished home, there are lots and lots of areas that you won't be able to scan, like under a dining room table. So the model won't be very good because of all the "scan shadows" caused by chair legs from the various angles blocking the floor underneath the table. There are also areas in small rooms (like bathrooms and closets) you won't show up well in the model just because there's not room enough for many distinct scans in those tight spaces. So, for example, you rarely would have a complete model of a toilet in a scan because the camera is almost never going to get to see both sides of a toilet due to the walls that are usually on at least one side of a toilet. I imagine that in some future version of Mattport, you might be able to supplement the scans from the Matterport camera with scans from a smaller handheld camera that you could more easily stick in tight places to fill in the missing areas. And then one more thing. Smaller objects don't get modeled well, which is just kind of due to the resolution the model is designed to achieve. The models are supposed to look good from the Dollhouse or Floorplan views, but viewed from inside. That's why Matterport uses the panos for viewing inside the home, not the actual models. 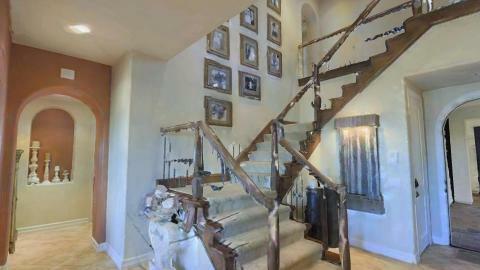 You can see in the picture below how crappy the rungs in the staircase came out when you look at them closely. Even though I took a number of scans from the room below the stairs, and then a scan on each landing, and also a scan from halfway up between two landings. I'd be happy to send you an obj file from one of my scans, but if you are hoping to get high quality 3D models viewable from the inside, these Matterport generated models are not going to be sufficient for your needs. It might be an interesting experiment to scan a relatively small property, maybe 2000 square feet, of a sparsely furnished or unfurnished space using all 200 available scans and see how the resultant model turned out. I actually talked to Tim about this not too long ago. Interesting debate and balance between high density and high speed/ reliability. I have been told (by Bob) that the 200 is just as suggestion and there is no actual cut off at that point. I was also warned that going over 200 would likely cause processing time to go from several hours to several days because a different method had to be used. Here is an example of a 13,000 ft^2 chuch, (only 180 scans). A little different deal than your normal property. Thank you all for the great replies, you have answered my questions perfectly! I'm actually excited about how 200 scans on smaller homes would turn out. Also, if you happen to scan 200x on a smaller space, and it turns out well. That would be a deciding factor for me. I'm not aiming to scan spaces larger than 2000sqft. Why more interest in the .obj than 3D Showcase? That's actually the .obj I've been playing with, thank you for the upload it's been super helpful. I'm not interested in the 3D showcase, I'm more of game designer. I'm trying to see if Matterport, is able to 'potentially' create something I can use for games. When I look at project tango, it seems to make more sense because it's more portable. However Matterport claims their camera is higher in quality. So I'm assuming they mean the texture is higher res? Either way, I'm just at the early stages of researching this stuff. The tech is moving so fast, it's hard to tell what is most suited for what I need. Again thanks for the beautiful mansion. I was able to clean it up a little, with added lighting/shadows the distortion was less visible. It's not my finest work, but it is a house I own, so I feel comfortable sharing it like this. I'm actually in the process of remodelling it, and in about a month it should be done. It would be a good candidate for doing 200 scans in a smaller home, and I can scan it before it is furnished and then again after it is furnished. This Matterport User Group Thread includes 30 scanning solutions. 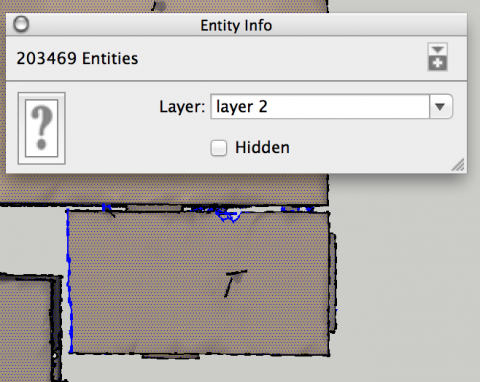 To do the 10,000 SF house within the 200 scan limit, I did not have the luxury of thinking about the mesh. In the Matterport Camera wish list thread, what could Matterport do differently to improve the mesh for game designers? Seems like enabling game design of real spaces and enable game designers to do so quickly would be way cool. Ok I have a question that maybe someone has some insight too. While experimenting in different obj programs I noticed my files were not importing with the same scale consistently. I imported a few different models in the same program side by side to show the example. The two models on the right use the same data for the house but the far right has more scans added to it. All the models have roughly the same length on the X axis. Does this mean that larger models have a larger base unit and therefore have less resolution in the obj and 3D file so they can can "fit" in this space? Any ideas? I believe that the real dimensions of the model are implicitely embedded in the obj file (unit = meter) and therefore two scans of the same house should reveil dimensions very close to each others. I've noticed this already by scanning twice the same room in caves (see one of my previous posts). Now regarding what you notice, couldn't it be the program you're using (what is it?) 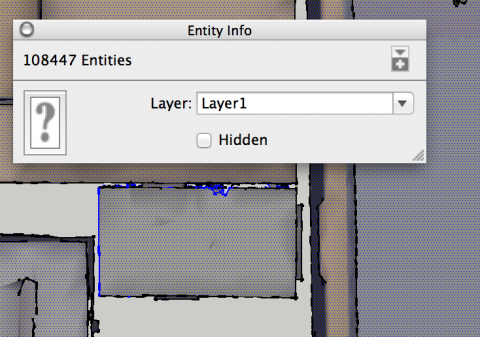 that "resizes" the models to use the display area at its maximum? Ok after further investigation in multiple programs and multiple head to head comparisons of different sections; it seems as if the more scans you get the lower quality of the obj. The file with less scans has about 2x MORE entities than the file with extra scans added. This shows that the more scans you add the lower the quality of the 3D file gets (maybe to balance processing speed). For the record both selections are of the exact same room (bathroom) of a house. The scan file on the top is the same property as the scan on the bottom but the scan on the top had about 80 exterior scans added. If anyone can independently confirm this that would be a big help. If you want to export it to a point cloud to fly/walk around and measure easily, I recommend using Autodesk ReCAP Pro. The programs that work with .OBJ seem hard to navigate in. We have found the dimension are accurate(with 1.5" or better). I am very curious to know if the dimension are accurate or not with more scans too. Might do some testing. Any idea of the planned price for these pieces of software? DO you know if there exists a free trial version available? Regarding the accuracy of dimensions, it seems from previous posts that it can vary a lot. Regarding my few scans and my personnal experience, most of the time I noticed about 1'' (2-3 cm) of difference with reality within rooms. Recently I've tried to scan caves (https://forum.we-get-around.com/topic/179/caves-230-feet-70m-below-the-surface/#16), and two successive scans of the same "room" (with different lighting) have shown about 1'' of difference as well. You should be able to find those programs on the autodesk website to download trials etc.